The Mal Malloy Compilation DVD - over 2.5 GBs of the notorious "Easter Egg" videos in their original format - which in some cases is 720 p HD - and some new clips at her curvier size. NOTE: This will not play in your DVD player; it contains data files which are readable on your computer via a program like VLC. In the US, shipping will take between 3-5 days to arrive from the date of shipping (you'll receive an email notification when your order ships). Internationally, however, it will take longer. As an amends to those overseas who have to endure the extra wait, Mal included a couple bonus clips that are not on the US Version. Mal kindly requests that those who chose to purchase the DVD keep it in their private stash and not post the clips on Youtube, Daily Motion, etc. Paypal is the only method of payment, and shipping will be via USPS Priority Mail, both internationally and in the US. NOTE: This is a limited time sale which will include a password and link to the video in the image to the left, which is previously unseen. Four to six (4-6) weeks for shipping. 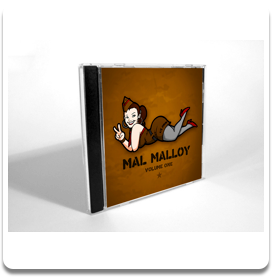 Mal Malloy Complication DVD with high resolution versions of all easter egg videos and a few new/unseen clip. Purchasers will also get a hidden link to a completely new clip.